Remove top of pumpkin. Quarter pumpkin and remove seeds, set aside. Scrape out remaining small seeds and the stings. Place each quarter face down in a baking dish and roast for 30-40 minutes or until pumpkin is tender. Remove and let cool slightly. Carefully remove pumpkin from the shell and measure out 3 packed cups of pumpkin and set aside. Rinse seeds, removing any pumpkin left on them. Toss with olive and salt. Spread out on a baking tray and roast until crispy, 10-15 minutes. In a sauce pan heat 1 tablespoon olive oil. Add in scallions and sauté for 2-3 minutes. Stir in curry powder and let cook for 30 seconds more, just until fragrant. Next, add the pumpkin to sauce pan along with 2 cups veggie broth. Bring to a boil, reduce to a simmer, and let cook for 2-3 minutes. Remove from heat and puree with immersion blender (or carefully with a regular blender), adding more veggie broth to reach your desired soup consistency. Return to heat, add in 1/4 cup coconut milk, and let simmer until ready to serve. 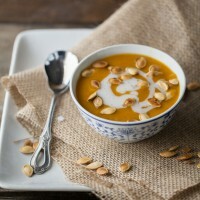 Serve with an extra swirl of coconut milk and roasted pumpkin seeds. + If you don’t want to mess with the pumpkin, pre-made pumpkin will work. + In the same line, if you don’t want to roast the seeds (or don’t roast the pumpkin), pre-roasted pumpkin seeds would work or you can use pepitas. + Instead of using curry powder, curry paste will work as well but taste the past before using. If it’s overly powerful (or spicy), reduce the amount used accordingly.